A new report by Brazil’s Globo Television reveals that the United States government spied on Brazil’s national oil company Petrobras. The revelations are the latest National Security Agency (NSA) spy allegations involving Brazil that have damaged relations between the two nations. According to the television network, slides from a NSA presentation last year showed the agency’s capability to infiltrate private networks of companies such as Petrobras, Google Inc, and the Society for Worldwide Interbank Financial Telecommunication (SWIFT). 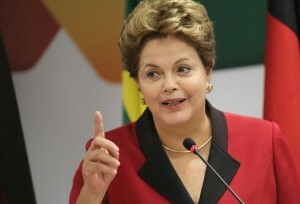 Brazilian President Dilma Rousseff said last week before the Petrobras allegations were revealed that US spying included “strategic factors or to do with commercial and economic factors.” The president said this was “economic espionage”. It is the second report aired by the Brazilian broadcaster co-authored by Guardian journalist Glenn Greenwald. Rousseff said during the weekend that US President Barack Obama had agreed to respond formally to the spying allegations by next Wednesday. Brazil and US ties have come under increasing strain as the Brazilian Senate formed an Investigative Parliamentary Commission last week to probe the NSA spying reports. The Latin American nation has already cancelled a trip by a team of logistical planners, security personnel and protocol officers that would have left this weekend to start preparing for Rousseff’s upcoming US visit. Rousseff who is due to make a formal state visit to Washington on October 23, said after her meet with President Obama in Russia that she would await US response on spying allegations before deciding on the trip. Obama has said recently that American intelligence agencies are not “snooping at people’s emails or listening to their phone calls. “What we try to do is to target, very specifically, areas of concern,” he said, adding that such areas included counter-terrorism, weapons of mass destruction and cyber-security,” said the US leader. Justice Minister Jose Eduardo Cardozo told a recent press conference after an emergency meeting with Rousseff that they expected a formal written response from the US government. Petrobras’ output from new deep-sea fields has now reached 300,000 barrels a day and by 2020 the company expects to double overall production to 4.2 million barrels a day.